CROSS | Landscaping & Lawn Care Inc.
Landscaping & Lawn Care Inc.
Cross Landscaping & Lawn Care is committed to delivering a full range of custom landscaping services to our residential and commercial clients. Beautiful, well maintained landscaping greatly enhances the property value of your home and adds to your overall quality of life. Whether your home sits on a spacious terrain with limitless possibility or on a standard suburban lot, Cross Landscaping & Lawn Care can help transform it into a beautiful oasis that will be a source of pride and enjoyment for years to come. No landscaping job is too big or too small for the landscape professionals at Cross Landscaping & Lawn Care. Our landscape designers, horticulturists and maintenance engineers have the experience and knowledge to help you plan and implement a landscape design that suits your taste and lifestyle. Whether your landscape is a blank canvas or a work in progress we can help make your dreams a reality by helping identify the right vegetation for your property's terrain, soil type and exposure. From selecting the perfect centerpiece tree to accent flowers, groundcover, and hardscaping including patios, walkways, retaining walls or even an outdoor kitchen we integrate all these elements into beautiful, harmonious works of art that will provide you with outdoor enjoyment year round. Whether your passion is profuse, vibrant flower gardens or the serenity and functionality of a lush expanse of lawn, Cross Landscaping & Lawn Care can help. Our landscape experts will begin with a soil analysis to determine whether modifications in organic chemistry and moisture levels are in order. If necessary we will make the necessary modifications including installation of irrigation lines and tree and bush trimming and removal. If soil modifications are necessary we use only high quality, organic additives to ensure the safety of your family, pets and beneficial wildlife. 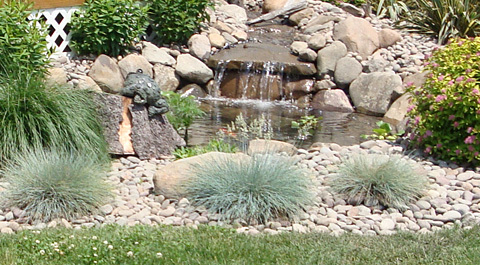 Cross Landscaping & Lawn Care will help you identify the best native or hybrid plants, perennials or annuals depending on your taste and vision. Through our association with reputable growers Cross Landscaping & Lawn Care will select only the healthiest, hardiest specimens for your lawn or garden. Once we've completed planting you can rest assured that we'll maintain your beautiful new plants to ensure they thrive and provide years of enjoyment. With help from Cross Landscaping & Lawn Care you won’t have to limit your lawn and garden’s potential to only the warmer months. With the proper planning by Cross Landscaping & Lawn Care your landscape can provide year round color and variety. Contact Cross Landscaping & Lawn Care at (845) 883-4069 to schedule an initial consultation and get that lawn or garden you've always wanted.